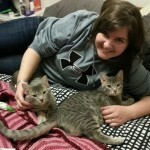 After many months of waiting Puff and Silver Fox were adopted together! 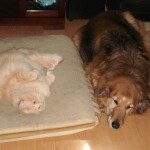 They came to FFL as un fixed Strays and were both Spayed and Neutered by Fixed Fur Life. 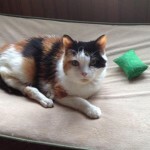 Abigail was a severely disabled senior girl (born with non functioning back legs and x rays revealed trauma to her lower spine) found outside is below zero weather in a blazing snow blizzard. No identification and no one ever came forward to claim her. She was taken to Animal control and Fixed Fur Life rescued her from there the next day. She was severely emaciated, severely dehydrated, full of worms and had the most severe infestation of fleas I had ever seen. She was also suffering from an upper respiratory infection and was severely constipated to mention just a few of her ailments. After weeks and weeks of medical care I am happy to report that she is fully back on track and we found her a wonderful home with a wonderful lady! Shown here in her new home resting on her orthopedic bed. As she has difficulty getting into a normal litter box she has now been trained to use a puppy pad. She will out her golden years with her new mommy and new brothers and sisters! Pollux and his litter mates were born in foster care. Momma was a stray who has been spayed as well. He has now been adopted! 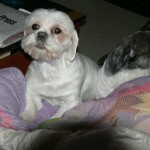 Candy and Kenzie's owner is palliative and could no longer care for them. They have now both been adopted! Bo and her litter mates were born in foster care. Momma was a stray who has been spayed as well. She was adopted with her brother Castor! Castor and his litter mates were born in foster care. Momma was a stray who has been spayed as well. He was adopted with his sister Bo! Bubbles and Tubby's mother was an un spayed female. 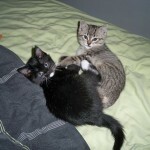 Their owner gave them away on Kijiji and the person who took them could not keep them. The girls were inseparable. One would cry when the other was out of the room. They have now been adopted together! 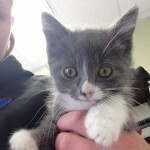 Snoopy 1 of 8 kittens who recently graced our steps has now been adopted! Mom will also be Spayed through Fixed Fur Life to avoid further litters. 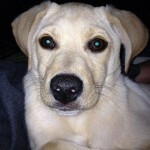 Pacey came to Fixed Fur Life many months ago. His brothers and sisters have all been adopted (except Lucky who is still waiting) All have been Spayed and Neutered and Pacey has gone off to his new home! 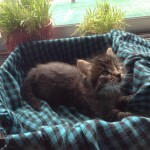 Honey Boo Boo was a stray kitten that was fixed and vaccinated through FFL. Later when strted to limp x rays revealed a congenital hip problem. 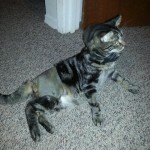 Surgery was done and he is now back at home with his new family. Katie came to Fixed Fur Life with her 7 siblings. 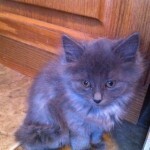 Born to an un spayed female exposed to and Un neutered male. She was adopted and her mother will be Spayed. Joseph was found on a critically cold day frozen to the ground. Un Neutered and mal nourished with zero identification he came to Fixed Fur Life. He required intensive treatment as he was hypothermic with wounds to his feet and tail. 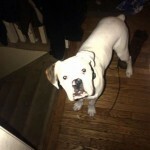 He was neutered and vaccinated through FFL and is shown here in his new home. 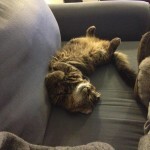 He is really enjoying his indoor neutered life where his new people love him dearly! A few years ago, I was looking for an adult cat to keep my older dog company. I found out about Riggs (aka Zeus) thru a connection by Fixed Fur Life. Riggs makes me laugh everyday. I cherish our weekend naps together, and he has completed our little family. Riggs is a special cat, who has touched my heart forever. Thank you Fixed Fur Life for helping us come together. 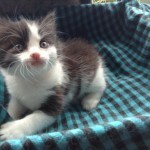 Darcy came to Fixed Fur Life with her siblings and mother. Her mother a pregnant stray. 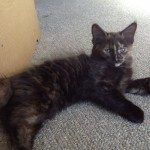 She and her siblings have all been Spayed/Neutered and adopted. Darcy shown here in her new home! Scarlet's owner could no longer care for her. She then fell into the hands of someone trying to sell her for breeding. She was rescued and Spayed by Fixed Fur Life and has since been adopted. 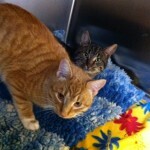 Tom and Jerry were one of 9 cats that came to Fixed Fur Life in the middle of a blizzard. Their owner passed away and they were put outside to fend for themselves. 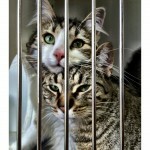 They were neutered by FFL and have been adopted out together. I just wanted to update you on Teddy and Timmy! 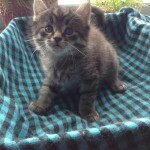 They are super playful, social boys and love to cuddle. Nick Wojcik and I extremely grateful for everything Fixed Furlife and you (Darlene) do for animals. Without you guys, Teddy and Timmy might never have found their forever home. 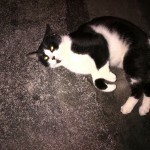 Pedro's owners moved and could not take him with them. A really sweet boy he has now been adopted into a new home! 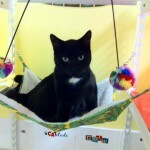 Mr Darcy is a handsome boy who came to Fixed Fur Life as a stray with zero identification. 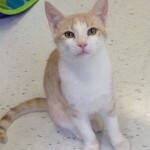 Neutered by FFL he has been adopted! Bear came to Fixed Fur Life with his mom and 7 other siblings. All have been Spayed and Neutered and now adopted!